The members of the 14th Armored Division Association support the Army Historical Foundation in its mission to fund a National Museum of the Army. The U.S. Army is the only branch of the military that does not have a national museum, and the LIBERATORS believe it is long overdue. They urge every American to join them in seeing that this worthy project is completed so our fellow citizens will learn what the men and women of the U.S. Army have done to create, preserve, and protect this great nation of ours. The US Army has never had a national museum to focus on the history and heritage of the American Soldier. It has never had one central location where visitors could learn and appreciate the Army’s role in our nation’s development. This is about to change. The National Museum of the United States Army is now under design and is destined to become the best military museum experience in the country. Located at Fort Belvoir, Virginia, just south of the nation’s capital and 30 minutes from the Vietnam Veterans Memorial, the Army’s National Museum will portray and preserve the Army’s unique heritage, both as an institution and as one of the cornerstones of American democracy. The state-of-the-art facility will illustrate how the Army’s history is intricately interwoven through all aspects of the American experience. Through interactive exhibits, educational programs, and simulation displays, the Museum will educate a million visitors annually. Personal soldier accounts of service and sacrifice will offer visitors an invaluable perspective on how much our country owes its Army and its Soldiers—past, present and future. At a time when the Army’s role is becoming less apparent, this world-class Museum will help visitors better understand that the values of America’s soldiers—service, sacrifice, duty, initiative, ingenuity, resilience, honor, and courage—truly represent the most unique and distinguishing features of our national character. The Army’s National Museum will be far more than a place of dusty display cabinets. It will be a total experience that will forge a profound connection with Army Soldiers, Army Veterans, and the American public. It will tell the stories of combat heroism, it will relate the epic descriptions of our great battles, and it will reveal little-know facts about the Army’s contributions to science, medicine, exploration, and civilian quality of life. 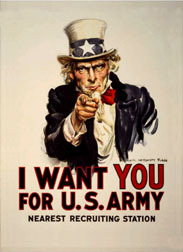 It will depict the evolution of the US Army as part of and contributing to America’s social and cultural growth. The story of the US Army and America is immense and complex. Accordingly, to bring some order to this material, planners have decided to present information in three broad areas. The Museum’s central core will provide a general overview of Army history as it relates to the Evolution of the Army in an American Democracy. Visitors will travel through a series of galleries evoking conflicts that defined key turning points in American history. One of these galleries, for example, will focus on the Army in Vietnam. Of all the Cold War conflicts, Vietnam was the most difficult and most costly for the Army. As it struggled to fulfill its mission assigned to it by policymakers, the Army fought a difficult foe while facing public hostility in an increasingly unpopular war. Visitors will appreciate the sacrifice this demanded as they enter a jungle clearing and see a helicopter in the midst of landing supplies and evacuating American wounded. Exhibits will examine how the Army dealt with an unpredictable enemy who used guerrilla tactics. Other areas of this gallery will explore the role of helicopters and their ability to provide mobility in a jungle environment. A second series of galleries on The Army in Defense of the Nation will focus on the Army’s evolution since 1775 from the perspective of individual Soldiers. Finally, a series of special Thematic Galleries will examine the broader relationship to American society and culture. Here visitors will learn how the Army helped build America, and how it continues to change and grow along with the society that sustains it. Each gallery addresses a separate theme that runs throughout the history of the US Army and the nation. In all, The National Museum of the United States Army will be unlike any other military museum in the world. It will present the US Army in its total context, placing the American Soldier and the American Veteran in his or her rightful place—as an historical cornerstone upon which our country not only has survived but also grown and prospered. The world’s most respected and capable ground force deserves a world-class facility. The Army indeed has a story to tell. And The National Museum of the United States Army will finally tell it, making make every Soldier, Army Veteran and every citizen proud of America’s Army. All Rights Are Reserved and may not be replicated without express permission.